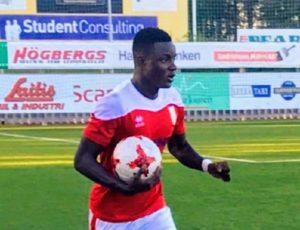 Sierra Leone defender, Abu Suma, scored his first goal of the season for his Swedish Division 1 side, Assyriska in their 2-3 home defeat by Rynninge on Sunday at the Södertälje Fotbollsarena. August Holmberg gave the visitors the lead in the 11th minute before doubling his lead 22 minutes later. However, the 22-year-old Sierra Leone defender gave the home side hopes of coming back in the game with his 40 minutes strike. Love Reuterswärd level things up three minutes after the recess, but Suma’s Assyriska hopes of walking away with a point from the match ended Berger gave the away side the 2-3 lead. Another Sierra Leonean defender in action over the weekend was Ishmael Koroma whose side Åtvidaberg secured a 2-1 win over Utsikten. In Denmark, striker Mustapha Bundu was given 76 minutes run-out for AGF in their 1-1 draw with Vendsyssel and a step further in the Denmark league, Christian Moses failed to hit the target despite his side Viborg 0-5 thumping of Lyngby. Sierra Leone forward was later substituted in the 65th minute. Striker, Mohamed Buya Turay was called to 46 minutes action for Saint-Truiden as they defeat KV Oostende 1-0 while Sierra Leonean duo; Ibrahim Kargbo and Mohamed Kamara both featured full time for Dulwich Hamlet in their home defeat by Hampton & Richmond. Another Sierra Leonean pair, Kwame Quee and Ibrahim Sorie Barrie both featured for the winning Víkingur Ólafsvík who defeated Thór 2-0. Quee was substituted in 73 minutes while his countryman had full-time action. In Finland, Hassan Sesay played for 46 minutes as his Lahti side were forced to a 1-1 draw by VPS and elsewhere, Mohamed Koroma TPV secured a 2-0 win over SJK Akatemia. George Davies played full-time for Riga FC in their 3-0 win over Valmiera. The Sierra Leone winger also picked-up a yellow in the 54th minute. Moving away from Europe, striker Kei Kamara and his Vancouver Whitecaps secured 2-1 home victory over San Jose Earthquakes with the Sierra Leonean forward playing 81 minutes before been replaced by Erik Hurtado and in the USL, Michael Lahoud was introduced in the mix in 66th minute as his Cincinnati secured another home win defeating Pittsburgh Riverhounds 2-1.